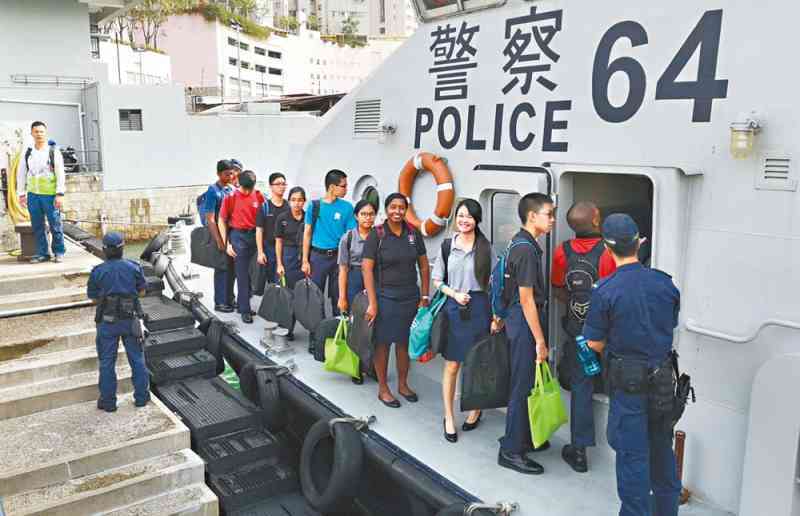 A 35-member delegation from the Singapore National Police Cadet Corps (NPCC) visited Hong Kong from November 7 to 11 on an exchange programme with the Force. The Police Public Relations Branch (PPRB) arranged for the delegates to visit several formations and units, including the Counter Terrorism Response Unit, Traffic Kowloon East Headquarters, Marine South Division and the Peak Police Station. The programme enabled the NPCC delegates to gain a better understanding of the Force and foster cultural exchanges with Hong Kong Junior Police Call (JPC) members. The NPCC is a uniformed group jointly organised by the Singapore Police Force and the Ministry of Education in Singapore. It shares common goals with the JPC Scheme in enhancing self-confidence and competitiveness of youngsters, nurturing their positive values and equipping them to become future leaders. Since 2009, the PPRB and the NPCC have been conducting annual exchange programmes for young people with the aim of broadening their international horizons.